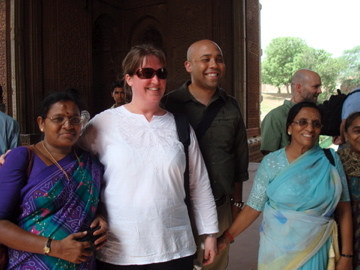 I’ve had interesting experiences as a member of a minority while traveling to India–someone who fully admits that she often thinks and speaks of “otherness” in an intellectual setting, but who rarely has an opportunity to experience minority status as a real, lived experience. That’s why I’m here. To have a hands-on experience in a culture other than my own with the hopes of gaining insight into the people, their history, their customs, their prejudices, their location, many of their beliefs, and, particularly for me, their arts. To become better aware of myself, not from reading books but by experiencing something separate from the familiar. My awareness began in a simple way at the Newark airport as we waited to board our 14+ hour flight to Delhi. As we gathered at the gate the large group of my fellow travelers around me made primarily of Indians looked strange all of a sudden. Out of place. Foreign. Then I became increasingly aware of my own presence and was reminded of a conference visit many years ago to Atlanta. Along with some friends, my husband and I went to the CNN Center via the underground. As we gathered, waiting for our transportation, I became aware, in the same way I had at the airport, of my existence as “other.” I don’t use that term in a pejorative way. But “other” is appropriate because it reflects the feeling of tension I was experiencing. I had brought the tension with me–perhaps from white guilt, perhaps out of an anxiousness at looking inward, or perhaps simply out of inexperience. Hours after we left Newark on Wednesday (and three movies, a nap, dinner, breakfast, snacks and another nap), I found myself once again feeling a personal tension. We were asked to fill out a form to get through immigration, which I did. As I sat, waiting for the plane to coast to our final departure post, I reread my form, realizing I had left blank the center section, which read, “To Be Filled In By All Foreigners.” I began to blush. And then I filled in the middle section. And it happened again today when we visited Qutab Minar mosque. We, along with the other non-Indians there, were asked several times by the Indian women to take our picture with them (see photo above). They tugged on our hands, gathered us together and smiled along with us at the clicking cameras. Suddenly we were the phenomenon, the strange and mysterious. So much so that they needed to photograph us to show others. The Indian men never asked; they merely stood close by us while someone took their picture in silence as if a sudden noise might scare away the herd of interesting and exotic creatures. That really is what it felt like. And suddenly I became self-conscious in a new way. Not as in Atlanta or at the airport. My “otherness” felt usurped. One of my colleagues talked about the occurrence as something similar to being a sight for those visitors to Wooster who want to see the Amish in our community. I thought of it in relation to visiting Disney Land, where small children (and sometimes adults) are encouraged to gather around the Disney characters to have their photos taken. In essence, I felt on display in a way that was not only uncomfortable but also unwelcome. It was challenging to smile at the camera. I didn’t particularly like being the center of attention because of my strangeness. I didn’t want to be looked at as a character or a mystery. But then I acknowledged my ethnicity, and I was swept away with that personal tension between understanding my own uniqueness and the discomfort of being made self-aware of my “otherness.” I’m certain this will not be the last time I experience my minority status while in India. Nor would I have traded that experience for anything in the world. My insight has been sharpened. My love for greater understanding has increased. And my strangeness and difference have become insightful, and I have begun embracing the tension that reminds me of my ethnicity, my race among the many throughout our world.